In the midst of all the hustle and bustle of our busy lives (particularly during the week), it’s especially important to try to keep healthy habits like getting enough sleep, exercising, drinking plenty of water, and eating well. One of the best things you can do to keep your body properly fueled (and to avoid overindulging in not-so-healthy treats due to hunger) is to always have a snack or two with you. This On the Go Apple, Cheddar and Almonds snack is a cinch to put together and makes a perfect snack that’s satisfying and easy to eat anywhere. Share this grab and go snack with friends and family on Facebook, Pinterest, Instagram, and Twitter. They are sure to appreciate it! You just need three ingredients for this healthy and satisfying snack: ½ cup of sweet apples like Pink Gala, Gala, or Pinata (diced), ¾ ounce of Cabot Sharp Cheddar (cubed), and 1 ounce (about 30) of unsalted almonds. Once your ingredients are prepped, simply pack them into separate compartments of a divided container and keep chilled until ready to eat! For another healthy snack idea that will help you get through the busiest of days, be sure to make this delicious Red, White, and Green snack made with edamame, dried cranberries, and cubes of Cabot Seriously Sharp Cheddar. Cabot is a cooperative of over 800 farm families who continuously strive to produce the best dairy products around. If you enjoy this simple snack, we’d really appreciate it if you could rate and review it! 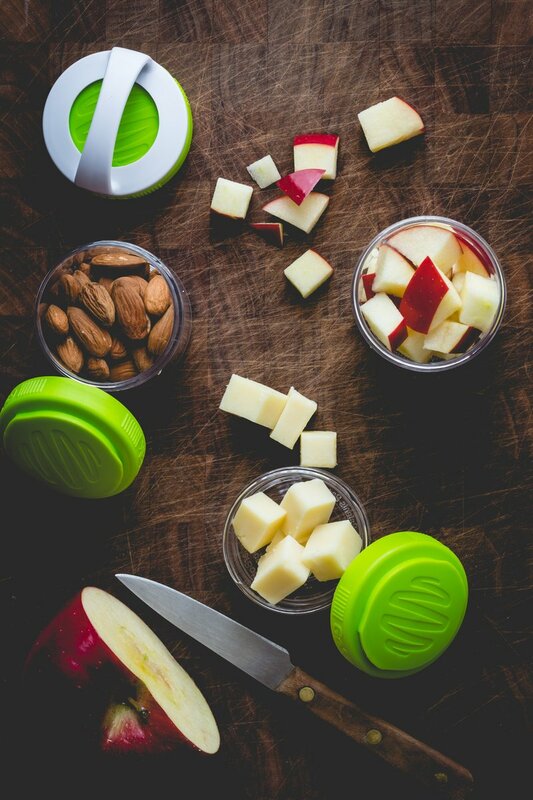 PACK apples, cheese and almonds into separate compartments of a divided snack container. Keep chilled until ready to enjoy. This is the perfect healthy snack when on the go!